It looks great, but it's kinda underwhelming, compared to the city. I might of had high expectations, but I was expecting something like this, considering the rumored price is $300. Does the employed position of Master Builder mean designing sets, say architecture/buildings, or is it something different? Just saw episode 77, and wow, Ninjago is in top form. The lore is great, the characters are mostly competent, and it’s somewhat mature! The one on the right was noted to wear the same clothing as Harumi. There is something else too. Look behind the mask. Notice something behind it? All I see is gray static behind it. What is it? I looked at the hair mold on my Koko fig, and the way the hair shapes at the bottom is that same as the hair behind the mask. And it just so happens that Harumi uses the same hairpiece as Koko. 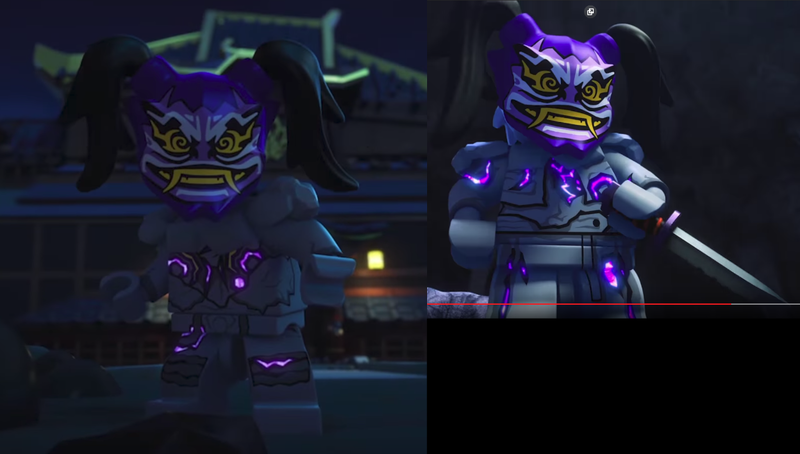 It's a bit of a stretch, but I think I can prove that Harumi is evil. You ready? So the origin of the first Spinjitzu Master was revealed in episode 77. It is really interesting and I am excited to learn more about it. That said, Harumi seems a bit too perfect. Sneaks out to feed the homeless, very kind, and not a character flaw to be seen. Except, of course, keeping Lloyd from saving that guy from the Sons of Garmadon. That made no sense, unless she’s tied to them. Unfortunately, I think she’s evil. Episodes have come out; love the intro. Episodes themselves are pretty well-scripted as well. Yep. This season is amazing so far. It's nice to know LEGO has a spelling editor.